Google is set to release Pixel 3 and Pixel 3 XL variants later this year. The two smartphones have been leaked on multiple occasions, and now one of the variants have been spotted on a benchmark site. Until now, leaks around the Google Pixel 3 XL had suggested that the smartphone will sport a single-camera setup at the back, a dual selfie camera setup, and a display notch. A Geekbench listing of the Pixel 3 XL has affirmed some of the specifications of one of the models. According to the latest listing, the Google Pixel 3 XL will pack a Snapdragon 845 processor, 4GB of RAM, and run Android P.
As per the Geekbench lisiting, the Google Pixel 3 XL was able to score 2,426 on the single-core test and rose to 8,355 on the multi-core test. The results achieved by the smartphone are not too impressive but appear to be good enough for a flagship. 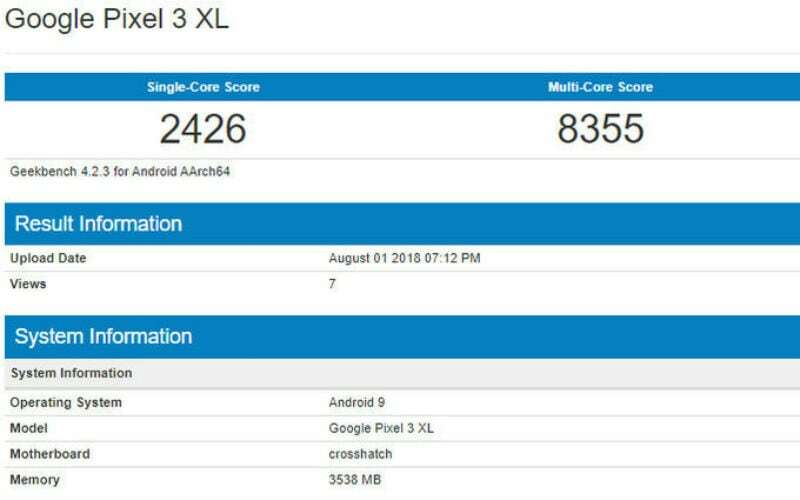 It showed the Pixel 3 XL running the benchmark with octa-core Snapdragon 845 processor with clock speed up to 2.8GHz, 4GB of RAM, and Android 9.0 P.
In comparison, the upcoming Galaxy Note 9 with Snapdragon 845 SoC and 6GB of RAM was spotted in a Geekbench listing earlier this year with a single-core score of 2,190 and a multi-core score of 8,806. It should be noted that there has been no official information from Google regarding the 2018 Pixel models. This is just a listing ahead of the launch and should be taken with a pinch of salt. Specification details are scarce at the moment, however, a previous report had noted that both the Pixel 3 and Pixel 3 XL will be powered by the Snapdragon 845 SoC, and at least the larger variant will have a 6GB RAM. The Pixel 3 is expected to sport a 5.4-inch display, while the Pixel 3 XL is expected to sport a 6.3-inch display. Alos, the Pixel 3 is tipped to measure 145.6x68.2x7.9mm, while the Pixel 3 XL is tipped to measure 158x76.6x7.9mm. The thickness increases to 8.6mm if the camera cut out is considered on both the phones. The Pixel 3 is expected to be pretty much similar to the larger variant minus a display notch, and a smaller overall size.